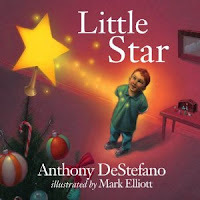 I was sent a copy of a sweet children’s Christmas story, Little Star, by the author Anthony DeStefano. With beautiful vibrant images, DeStefano uses the story of the Star of Bethlehem to convey the nativity story in a way small children not only understand, but will remember. My own children enjoyed the fun illustrations of the little star who gave everything he had to shine brightly and warm the baby Jesus. After reading it to her little sister, my eight-year-old daughter happily shared the beauty of the message contained in this simple children’s book with the rest of us. The author uses the birth of Jesus in the stable to help young people understand God’s Love and the importance of our love for another. With love, great things are possible, even from the littlest among us. Little Star is a beautiful children's story for this Christmas season.